Will the New Tech Economy Solve the Old Economy’s Racial Problems? Research shows that more-homogeneous companies are more prone to misguided groupthink, are less creative, and tend to be less profitable. Although more and more research shows that diversity is good for business, workforce statistics released by Silicon Valley technology companies show a startling lack of diversity. For example, Latinos and African Americans combined make up less than 5 percent of the tech workers at Google, Facebook, Twitter, LinkedIn, Yahoo, and eBay. There is good reason to believe that women of color are even scarcer since both women and people of color are underrepresented in the new technology firms. One reporter dubbed a black female software engineer in Silicon Valley a “super-minority” because black females are such a rare finds. While Silicon Valley deserves special attention because of the importance of new technology companies to the economy and to Americans’ day-to-day social lives, it would be a mistake to see the problem as limited to Silicon Valley. National statistics show higher unemployment rates for people of color with science, technology, engineering, and math, or STEM, degrees than their white counterparts. Among young, recent college graduates with a bachelor’s degree in computer science or mathematics, the white unemployment rate is 5.2 percent, lower than the Asian American rate of 7.7 percent, the Hispanic rate of 9.2 percent, and the African American rate of 10 percent. (see Figure 1) A similar pattern exists among those with degrees in engineering and the biological and physical sciences. For all of these fields combined, the Latino and Asian American unemployment rates are 1.6 times the white rate; the black rate is 1.9 times the white rate. This pattern suggests a white advantage in STEM fields. The ratios of white-to-nonwhite unemployment rates among STEM degree-holders are similar to the ratios found among college graduates overall. 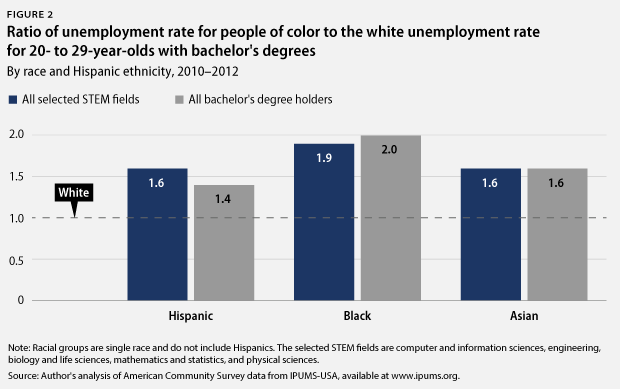 (see Figure 2) Hispanics with STEM degrees have an unemployment rate 1.6 times the white rate, compared to an unemployment rate 1.4 times the white rate for bachelor’s-degree holders overall. For blacks, the ratios are 1.9 in STEM and 2.0 overall. For Asian Americans, they are 1.6 both in STEM and overall. In recent years, there has been a push to have more Latinos and African Americans pursue STEM degrees, but there has been much less attention paid to the problem of discrimination in obtaining STEM employment. Unfortunately, workers’ education and skills alone will not prevent them from experiencing discrimination in the labor market. Perhaps the most surprising fact revealed by these data is that Asian Americans are at a disadvantage relative to similarly educated whites. As noted in previous research, Asian Americans’ disadvantage in the labor market tends to be hidden behind their very high level of educational attainment. To see their disadvantage, one must specifically compare college-educated Asian Americans with college-educated whites. Although Asian Americans with STEM bachelor’s degrees have a higher rate of unemployment than whites with STEM bachelor’s degrees, Asian Americans are overrepresented in STEM employment. Asian American representation in the STEM labor force is about three times higher than in the labor force overall. Even though Asian American STEM graduates are at a disadvantage in finding employment, the disadvantage is not great enough to overwhelm their high level of overrepresentation in the STEM labor force. Incorrect comparisons between whites and Asian Americans are often used to deny that discrimination exists against people of color. 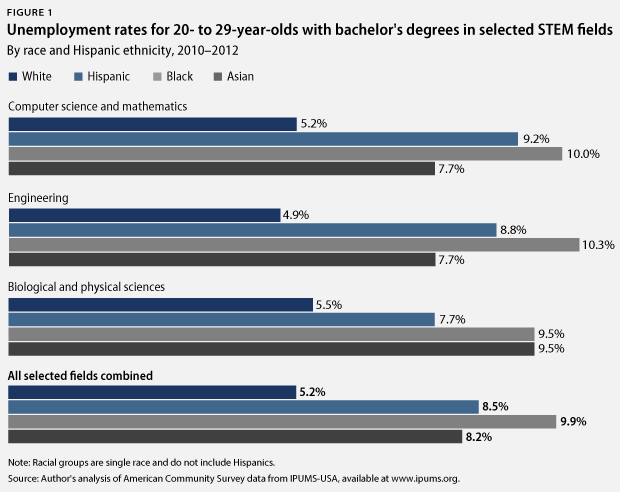 However, when the unemployment rate for Asian Americans with bachelor’s degrees is properly compared with the rate for whites with bachelor’s degrees—or, even better, the rate for Asian Americans with STEM bachelor’s degrees to the rate for whites with STEM bachelor’s degrees—a clear white advantage appears. Hiring is only the first step to equal opportunity in employment. Retaining and promoting employees is also essential. Erica Joy Baker has written poignantly about her feelings of isolation and alienation as a black woman working for more than 13 years in the tech industry. To be “one of the guys,” she had to put up with racist and sexist jokes, play violent video games in which she had no interest, play paintball despite her nightmares about being shot, and go to beer taverns even though she does not drink beer. Baker has an amazing level of fortitude, but she has suffered physically and psychologically by staying in her field. Many other women have left STEM occupations because they find the work environment to be hostile to women. People of color are also underrepresented in the leadership of tech companies. While Asian Americans are overrepresented as workers in Silicon Valley technology companies, they may face difficulties getting into leadership positions. At Yahoo, for example, nearly three-fifths of the tech workers are Asian American, but Asian Americans make up less than one-fifth of those leading tech teams. Relative to the Yahoo tech workforce, whites are highly overrepresented as leaders of tech teams. While Silicon Valley technology companies have created the so-called new economy, they seem to have continued the discriminatory employment practices of the old economy. While many leading Silicon Valley companies employ low numbers of Latinos and African Americans, there are those that show it is possible to do better. For example, 13 percent of Apple’s tech workers are Latino or African American. This is considerably higher than the 4 percent of many of its peer companies. Intel has set concrete goals to increase the diversity of its workforce by 2020, and it has allocated $300 million to achieve these ends. Ultimately, whether new technology companies break with the old patterns of exclusion will depend on the actions of the public. Ordinary Americans can vote with their dollars as consumers and put pressure on elected officials to ensure that anti-discrimination policies are enforced. At a time when STEM employment is increasingly important to the American economy, America’s old prejudices should not be allowed to hamper the nation’s future. Next Generation - Creating business in classrooms. The business landscape has changed. Know what's coming next.